STEREO在2006年12月4日以及紫外線拍攝的馬賽克影像。這些假色影像顯示出不同溫度範圍的太陽大氣。從左上角順時針依序為：100萬°C（171 Å—藍色）、150萬度(195 Å—綠色）、60,000–80,000 °C（304 Å—紅色）、和250萬°C (286 Å—黃色)。. ^ 1.0 1.1 Aschwanden, M. J. Physics of the Solar Corona. An Introduction. Praxis Publishing. 2004. ISBN 978-3-540-22321-4. ^ Corfield, Richard. Lives of the Planets. Basic Books. 2007. ISBN 978-0-465-01403-3. ^ de Ferrer, José Joaquín. Observations of the eclipse of the sun June 16th 1806 made at Kinderhook in the State of New York. Transactions of the American Philosophical Society. 1809, 6: 264. ^ Espenak, Fred. Chronology of Discoveries about the Sun. Mr. Eclipse. ^ Vaiana, G. S.; Krieger, A. S.; Timothy, A. F. Identification and analysis of structures in the corona from X-ray photography. Solar Physics. 1973, 32 (1): 81–116. Bibcode:1973SoPh...32...81V. doi:10.1007/BF00152731. ^ Vaiana, G.S. ; Tucker, W.H. R. Giacconi; H. Gunsky, 编. Solar X-Ray Emission in "X-Ray Astronomy": 169. 1974. ^ Vaiana, G S; Rosner, R. Recent advances in Coronae Physics. Annu. Rev. Astron. Astrophys. 1978, 16: 393–428. Bibcode:1978ARA&A..16..393V. doi:10.1146/annurev.aa.16.090178.002141. ^ 8.0 8.1 Gibson, E. G. The Quiet Sun. National Aeronautics and Space Administration, Washington, D.C. 1973. ^ How NASA Revealed Sun's Hottest Secret in 5-Minute Spaceflight. （原始内容存档于2013-01-24）. ^ Katsukawa, Yukio; Tsuneta, Saku. Magnetic Properties at Footpoints of Hot and Cool Loops. The Astrophysical Journal. 2005, 621 (1): 498–511. Bibcode:2005ApJ...621..498K. doi:10.1086/427488. ^ Betta, Rita; Orlando, Salvatore; Peres, Giovanni; Serio, Salvatore. On the Stability of Siphon Flows in Coronal Loops. Space Science Reviews. 1999, 87: 133–136. Bibcode:1999SSRv...87..133B. doi:10.1023/A:1005182503751. ^ 12.0 12.1 12.2 Giacconi, Riccardo. J. F. Linsky and S.Serio, 编. G.S. Vaiana memorial lecture in Proceedinds of Physics of Solar and Stellar Coronae: G.S. Vaiana Memorial Symposium. Kluwer Academic Publishers-Printed in the Netherlands. 1992: 3–19. ISBN 978-0-7923-2346-4. ^ Ofman, Leon. Source regions of the slow solar wind in coronal streamers. Geophysical Research Letters. 2000, 27 (18): 2885–2888. Bibcode:2000GeoRL..27.2885O. doi:10.1029/2000GL000097. ^ Kariyappa, R.; Deluca, E. E.; Saar, S. H.; Golub, L.; Damé, L.; Pevtsov, A. A.; Varghese, B. A. Temperature variability in X-ray bright points observed with Hinode/XRT. Astronomy & Astrophysics. 2011, 526: A78. Bibcode:2011A&A...526A..78K. doi:10.1051/0004-6361/201014878. ^ Ito, Hiroaki; Tsuneta, Saku; Shiota, Daikou; Tokumaru, Munetoshi; Fujiki, Ken'Ichi. Is the Polar Region Different from the Quiet Region of the Sun?. The Astrophysical Journal. 2010, 719 (1): 131–142. Bibcode:2010ApJ...719..131I. arXiv:1005.3667. doi:10.1088/0004-637X/719/1/131. ^ Del Zanna, G.; Bromage, B. J. I.; Mason, H. E. Spectroscopic characteristics of polar plumes. Astronomy & Astrophysics. 2003, 398 (2): 743–761. Bibcode:2003A&A...398..743D. doi:10.1051/0004-6361:20021628. ^ Pallavicini, R.; Serio, S.; Vaiana, G. S. A survey of soft X-ray limb flare images – The relation between their structure in the corona and other physical parameters. The Astrophysical Journal. 1977, 216: 108. Bibcode:1977ApJ...216..108P. doi:10.1086/155452. ^ Golub, L.; Herant, M.; Kalata, K.; Lovas, I.; Nystrom, G.; Pardo, F.; Spiller, E.; Wilczynski, J. Sub-arcsecond observations of the solar X-ray corona. Nature. 1990, 344 (6269): 842–844. Bibcode:1990Natur.344..842G. doi:10.1038/344842a0. ^ 19.0 19.1 Güdel M. X-ray astronomy of stellar coronae (PDF). The Astronomy and Astrophysics Review. 2004, 12 (2–3): 71–237. Bibcode:2004A&ARv..12...71G. arXiv:astro-ph/0406661. doi:10.1007/s00159-004-0023-2. （原始内容 (PDF)存档于2011-08-11）. ^ Vaiana, G.S. ; 等. Results from an extensive Einstein stellar survey. The Astrophysical Journal. 1981, 245: 163. Bibcode:1981ApJ...245..163V. doi:10.1086/158797. ^ Jeffrey, Alan. Magneto-hydrodynamics. UNIVERSITY MATHEMATICAL TEXTS. 1969. ^ Mewe, R. X-ray spectroscopy of stellar coronae. The Astronomy and Astrophysics Review. 1991, 3 (2): 127. Bibcode:1991A&ARv...3..127M. doi:10.1007/BF00873539. ^ 23.0 23.1 Spitzer, L. Physics of fully ionized gas. Interscience tracts of physics and astronomy. 1962. ^ Ulmshneider, Peter. J.C. Vial; K. Bocchialini; P. Boumier, 编. Heating of Chromospheres and Coronae in Space Solar Physics, Proceedings, Orsay, France. Springer. 1997: 77–106. ISBN 978-3-540-64307-4. ^ Malara, F.; Velli, M. Pål Brekke; Bernhard Fleck; Joseph B. Gurman, 编. Observations and Models of Coronal Heating in Recent Insights into the Physics of the Sun and Heliosphere: Highlights from SOHO and Other Space Missions, Proceedings of IAU Symposium 203. Astronomical Society of the Pacific. 2001: 456–466. ISBN 978-1-58381-069-9. ^ Cirtain, J. W.; Golub, L.; Winebarger, A. R.; De Pontieu, B.; Kobayashi, K.; Moore, R. L.; Walsh, R. W.; Korreck, K. E.; Weber, M.; McCauley, P.; Title, A.; Kuzin, S.; Deforest, C. E. Energy release in the solar corona from spatially resolved magnetic braids. Nature. 2013, 493 (7433): 501–503. Bibcode:2013Natur.493..501C. PMID 23344359. doi:10.1038/nature11772. ^ Alfvén, Hannes. Magneto hydrodynamic waves, and the heating of the solar corona. MNRAS. 1947, 107 (2): 211–219. Bibcode:1947MNRAS.107..211A. doi:10.1093/mnras/107.2.211. ^ Alfven Waves – Our Sun Is Doing The Magnetic Twist. read on Jan 6 2011. （原始内容存档于2011-07-23）. ^ Jess, DB; Mathioudakis, M; Erdélyi, R; Crockett, PJ; Keenan, FP; Christian, DJ. Alfvén Waves in the Lower Solar Atmosphere. Science. 2009, 323 (5921): 1582–1585. Bibcode:2009Sci...323.1582J. PMID 19299614. arXiv:0903.3546. doi:10.1126/science.1168680. hdl:10211.3/172550. ^ McIntosh, S. W.; de Pontieu, B.; Carlsson, M.; Hansteen, V. H.; The Sdo; Aia Mission Team. Ubiquitous Alfvenic Motions in Quiet Sun, Coronal Hole and Active Region Corona. American Geophysical Union, Fall Meeting. 2010,. abstract #SH14A-01. 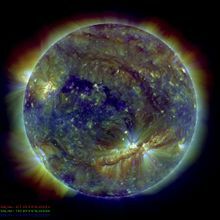 ^ Sun's Magnetic Secret Revealed. read on Jan 6 2011. （原始内容存档于2010-12-24）. ^ Kasper, J.C.; 等. Hot Solar-Wind Helium: Direct Evidence for Local Heating by Alfven-Cyclotron Dissipation. Phys. Rev. Lett. December 2008, 101 (26): 261103. Bibcode:2008PhRvL.101z1103K. PMID 19113766. doi:10.1103/PhysRevLett.101.261103. ^ Priest, Eric. Solar Magneto-hydrodynamics. D.Reidel Publishing Company, Dordrecht, Holland. 1982. ISBN 978-90-277-1833-4. ^ Patsourakos, S.; Vial, J.-C. Intermittent behavior in the transition region and the low corona of the quiet Sun. Astronomy and Astrophysics. 2002, 385 (3): 1073–1077. Bibcode:2002A&A...385.1073P. doi:10.1051/0004-6361:20020151. 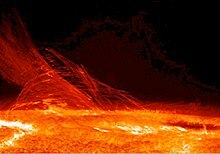 ^ Mystery of Sun's hot outer atmosphere 'solved' – Rediff.com News. Rediff.com. 2011-01-07 [2012-05-21]. （原始内容存档于2012-04-15）. ^ De Pontieu, B; McIntosh, SW; Carlsson, M; Hansteen, VH; Tarbell, TD; Boerner, P; Martinez-Sykora, J; Schrijver, CJ; Title, AM. The Origins of Hot Plasma in the Solar Corona. Science. 2011, 331 (6013): 55–58. Bibcode:2011Sci...331...55D. PMID 21212351. doi:10.1126/science.1197738.